This entry was posted in Gallery on 27/02/2015 by Becki. Are you looking forward to spring as much as I am? The first card is using the lovely daffodils from the Spring Scenes stamp set, I love daffodils they are one of my favourite flowers because they bring so much colour to this time of the year. The seed was sown so I got to work……. With the background done I set about creating the foreground….. Using several stamps from the set I stamped out a little scene on some white card to create a corner scene. I used Aqua markers and Distress inks to colour them. I cut a white border around the edge of them and then 3D’d them to the main image. With a little matting and layering and an added sentiment I was done! For the next one I used the same principles but this time using Birdsong Scene Stencil from Imagination Crafts ( another stencil on the program ) , I used Scattered Straw and Mustard seed Distress ink for the background…….The message is from Hobby Art Sunny Day Greeting Stamp set which I stamped in Vintage Sepia Versafine ink……. I created the foreground in the same way as the card above , just using daffodils this time and adding a little bit of sparkle to them…..
Well that is all from me for now, have a great weekend and look out for those daffodils popping there heads through the ground as Spring will soon be here….. This entry was posted in News and tagged distress inks, Hobby Art, Lisa B Designs, Lisa Baker, Spring Scenes, Stencils on 27/02/2015 by Lisa Baker. Hello, Heidi here to share another blog project with you today. 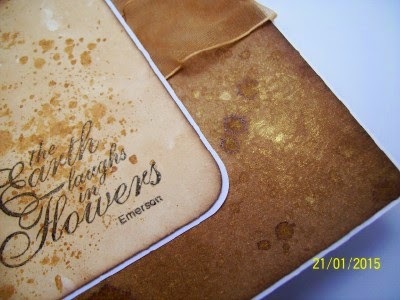 I have made a quick and easy card using the gorgeous new ‘Bouquet’ stamp set (on left), that was launched last month. It is such a statement image and is wonderful to colour in. I have coloured in the main image using a Memento ‘Rich Cocoa’ inkpad and some soft coloured Promarker’s. I have stamped the image, again in ‘Rich Cocoa’ around the white card blank and have matted the image onto some orange card, which makes the flower centres pop! Lastly, have added some linen twine and some cream pearls. You can find Promarker pens and ink pads galore on the website. This entry was posted in News on 26/02/2015 by Heidi Green. Have you had a good start to the week? It is my turn to share something on the Hobby Art blog today, so I thought that I would show you a card that I made for one of Jenni’s shows on Create and Craft. I don’t know about you, but my DT cards are often influenced by the classes or other projects that I am working on at the time, and this is no exception. I was prepping for a class on Tea and Coffee, a current favourite of mine, when my parcel arrived so that is what I have used here. 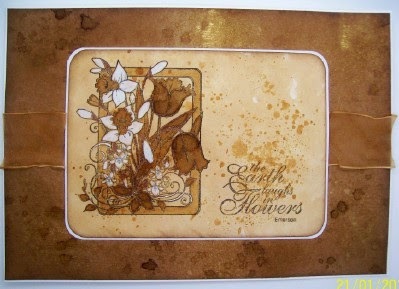 I stamped and embossed the beautiful Floral Frame onto a piece of background paper made using cold tea and instant coffee. 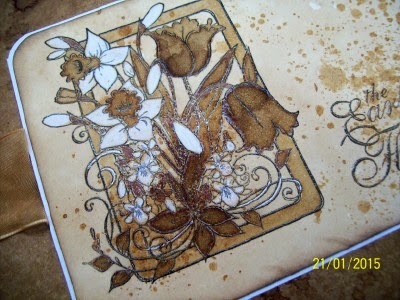 I also used coffee to paint the image and added white using a Gelli Roll glaze pen. I have also spritzed the papers with more coffee and some Glimmer Mist. I have a new parcel of stamps from Jenni eagerly awaiting my attention so I had better get on with it. This entry was posted in News and tagged coffee, gelli roll glaze pens, glimmer mist, tea on 16/02/2015 by Kim Reygate. October 1st dawned Purdy and been restless and nesting most of the night and at 8.10 the first pup was born by six that evening we had ten healthy fat puppies tired and hungry we cleaned her and fed her as she was feeding she passed what we thought was wind ….we were wrong there was pup number eleven because she was the youngest and smallest we called her Squirt….this little dog became Rory’s my youngest boys best friend …..we sold eight of our litter all without exception went to good homes, And we thought we had homes for two more but alas it was not to be so we ended up keeping two more pups, Jilla and Pierrot ….Now I know it may not be everybodys cup of tea but a house with five dogs is never boring….with the dog walking in mind how could I not do a card with Rory and his best mate walking over our local park using the brand new February Monthly Special – Old Barn. I cut the shape from my cricut and then bigger sizes to mat and layer added it to a square card behind and trimmed off the square edges All the inks used were distress inks I hope you like the card as much as I enjoyed making it ….this really is a peak into the everyday doings of a mad dog woman who loves to craft. Crafty Hugs Bernie xxxx Tail wags from Squirt! This entry was posted in News on 10/02/2015 by Bernie Simmons. Good morning, Heidi here to share a card with you. ‘Spring Scenes’, they really are beautiful images from the very clever Sharon Bennett. A soon as they dropped onto my door mat, I got them out to play. They are such bright and beautiful images. My card is a very quick and easy tent card. I have used a hexagon die to cut out an aperture from the centre of the front and have made a little concertina step that I have stuck inside. I have coloured in my images using my faithful Promarker pens and a Memento ‘Rich Cocoa’ ink pad. The wording is from the uber-useful ‘Alphabet – Typed’, my favourite set from Jenny. I seem to use it on most of my cards, its a really useful set with a great sized font. I have added some daffodils around my card and have glossy accented the large bunch. Thanks for stopping by the blog today, have a wonderful week! This entry was posted in News on 10/02/2015 by Becki. or post onto Facebook or Twitter and say it’s for the February Blog Challenge. £30 Voucher to spend on the Hobby Art Website. This entry was posted in Blog Challenge, News on 03/02/2015 by Becki. A BIG Thank you to everyone who entered Hobby Art’s January blog Challenge “Bright & Happy”. The entries are really Stunning and you seem to be enjoying the blog challenges. Alison Brittain – Winning the 2 New Clear Stamp sets and 2 Foam mounted Stamps. These Gorgeous Cards were made by Alison Brittain. This Gorgeous Card was made by Emily Follett. This Gorgeous Card was made by Helen Powell. This Gorgeous Card was made by Karen Paine. This Gorgeous Card was made by Linda Brooke. These Gorgeous Cards were made by Linda Walker. This Gorgeous Card was made by Liz Pentley. These Gorgeous Cards were made by Mikaela Hind. This Gorgeous Card was made by Moira Walters. This Gorgeous Tag was made by Noami Mahon. This Gorgeous Card was made by Pat Woodward. These Gorgeous Cards were made by Theresa Pace. These Gorgeous Cards were made by Viola Crossley. The New Challenge for February is “Spring” I will post a separate page with details and inspiration tomorrow. This entry was posted in Blog Challenge, News on 02/02/2015 by Becki. So finally… here are the step by step instructions to the Tree Cards (this is for you Pauline). So obviously my first thought was a pile of autumn leaves and my second was I want to build a tree! So here’s my original card template that I got made into a stencil. So I can easily repeat that base again. Here’s the more recent make with the Tree Stencil using the new Forest Friends alongside. This one I used the Wood Grain embossing Folder on the tree trunk. So depending which tree trunk you prefer will determine the accessory you need for the project. So I’m going to explain both cards as the only thing that is really so different is the technique for the base and I will show the instruction break off by Tree Trunk A or B. Now I made this stencil to my standard size cards I use. However making the tree taller or wider would be easy just by drawing around the bits you want and then moving the stencil either way and making it taller or wider. 3. I used Frayed Burlap Distress Paint to colour my trunk (A+B) but obviously if you have used kraft card you don’t have to. And just because I have used acrylic paints doesn’t mean you can’t use other mediums like Distress Ink Pads etc… Experiment and go with what you like most! Tree Trunk A – Use the tim holtz stencil and paint or sponge a darker brown acrylic paint through the stencil. Stencil all of the tree trunk. Tree Trunk B – use the wood grain embossing folder and run the tree trunk through your Big Shot, Cuttlebug etc… this will add the grain as well as adding texture to your card. Now you will have your finished Tree Trunk no matter which one you chose. Tip – use a similar colour card as you intend to colour the leaves that way if there are any gaps between leaves it won’t stand out. 5. Stamp the Oak leaf from the falling leaves set I used a Brown Memento but any brown ink pad will do . I normally stamp quite a lot so I have the leaves in bulk. 7. Distress all the leaves with Forest Moss. Add the colour relatively lightly, as once cut out you can go in and darken the colour. 8. Now cut the leaves out individually. 10. No-one will ever know you didn’t cut them out right to the line. I curled my leaves round a pen just to get that natural dimension and movement . Then attached them using PinFlair Glue to my circle die attached to my Tree Trunk. The only thing I will say if any of the outside leaves show past the circle cut out, I did distress some on the back just to make the back look neat. But that’s just me. Decorate the cards with critters…and job done! This one was just attached to a card. This one had a Card stand supporting it. Hope you have enjoyed the tutorial if there are any questions or something I have missed just leave a comment and I will get back to you. This entry was posted in News, Tutorials and tagged build a tree, handmade cards, Hobby Art, owls, rubber stamps, tutorial on 01/02/2015 by Becki.